Rodrigo Rato, Spain’s former deputy prime minister and ex-head of the International Monetary Fund (IMF), entered jail on Thursday in Madrid, after being sentenced to four and a half years for embezzlement while leading Bankia bank. Rato apologised to ‘society’ just before he began the jail sentence, in a case that sparked outrage at the height of the country’s economic crisis. The former Spanish economy minister, was found guilty in 2017 of paying for personal expenses with credit cards put at his disposal when he was the boss of Caja Madrid and Bankia, at a time when both banks were in difficulty. The 69-year-old had been free on bail pending an appeal but Spain’s Supreme Court last month confirmed his sentence of four years and six months. ‘I ask for forgiveness to society and those people who may feel disappointed or affected,’ Rato told reporters before entering the Soto del Real prison, north of Madrid. 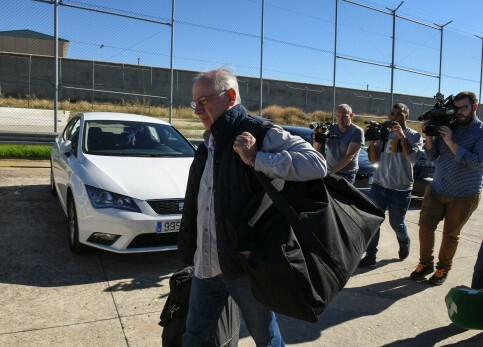 A spokeswoman for Spain’s prison system confirmed Rato entered the jail just after 1pm local time. Rato was both the economy minister and deputy prime minister in the conservative government of José Maria Aznar from 1996 to 2004, before going on to head the International Monetary Fund until 2007. His subsequent career as a banker in Spain was short-lived – from 2010 to 2012. But apart from the undeclared credit cards, it also led to another banking scandal considered the country’s biggest. Thousands of small-scale investors lost their money after they were persuaded to buy shares ahead of the flotation of Bankia in 2011, with Rato at the reins. The state injected billions of euros but faced with the scale of losses and trouble in other banks, it asked the EU for a bailout for the entire banking sector and eventually received 41 billion euros.